Rosa Rugosa Alba is a fast growing shrub with many small thorns. Fragrant white flowers appear in summer to autumn although some may have a pink tinge as they are grown from seed. Rosa Rugosa is a lovely species of rose native to Northeastern China, Japan, southeastern Siberia and Korea. A particularly good variety for coastal sites as it can even grow on the dunes themselves hence the different names relating to this for example saltspray rose and beach rose. The large rounded red hips produced in autumn are often referred to as tomatoes owing to their size and shape being very similar and again giving rise to alternate names such as beach tomato and sea tomato. These hips can also be used in the making of rose-hip syrup if they can be harvested before the birds get to them. 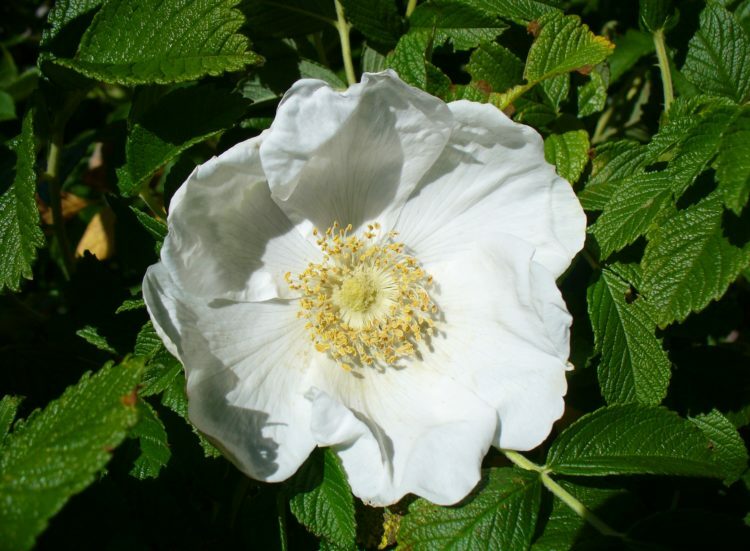 The name Rugosa in Latin means wrinkled which perfectly describes the quite attractive mid green leaves which set off the lightly scented white flowers which rather attractively can have a hint of pink in them as they are grown from seed. The pleasantly scented flowers of this fast growing rose are used to make pot -pourri in Asia and the plant itself is held in high regard by gardeners all over the globe owing to its resistance to rose rust and black spot both of which are the bane of the rose growing fraternities life. This prickly fast growing shrub makes an excellent security hedge or thicket whilst retaining an attractive appearance in a garden. Being so suited to coastal sites also makes this a superb choice for roadside planting when de icing roads in winter can mean salt spray can kill other choices of hedgerow. Rosa rugosa can be grown to a height of 120cm – 200cm as a single row hedge using 3 per metre or for the security option plant 5 per metre in a staggered double row. Being sold as bare root plants during their planting season of November through to April makes this an attractive and economical choice of hedge. If you have any queries about the Rosa Rugosa plants then do not hesitate to contact us and we will do our best to help.